Last July, California utility PG&E proposed four energy storage projects to replace natural gas plants in the South Bay. Economically, battery solutions already are competitive with new natural gas plants. In the future, underutilized electricity generation probably will be replaced by batteries. Elon Musk has stated that Tesla's (NASDAQ:TSLA) energy storage business will be as large as its car business in the long term.1 ARK's research shows that foregoing planned gas peaker plants and replacing them with utility scale energy storage could generate roughly $10 billion in revenues per year, more than six times Tesla's $1.5 billion utility energy storage revenue in 2018. As battery costs continue to fall during the next five to ten years, the global addressable market for utility energy storage should expand to $800 billion. Last July, California utility PG&E proposed four energy storage projects to replace natural gas plants in the South Bay.2 Two of these projects are the largest utility energy storage projects ever proposed - 1,200MWh and 730MWh - dwarfing the current record holder, Tesla's 129MWh battery in Australia. As battery costs continue to fall, utility energy storage will begin to compete with existing natural gas peaker plants, reaching a price point that will motivate utilities to shut down underutilized plants. 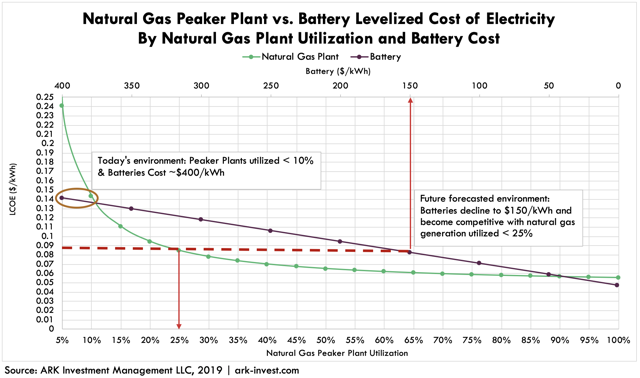 The chart below compares the cost of electricity from natural gas peaker plants to the cost of electricity from battery-based energy storage, with two scenarios highlighted. The brown circle illustrates the scenario we face today: the average natural gas peaker plant is utilized ~10% of the time in the U.S. resulting in a levelized electricity cost of ~$0.14/kWh.3 The red lines show ARK's forecast: utility energy storage battery costs should drop from $400/kWh to $150/kWh in the next five years, which results in an electricity cost of ~$0.09/kWh, undercutting the cost of natural gas plants that operate 25% of the time or less. Energy storage solutions should be able to compete for all future peaker plant additions. Economically, battery solutions already are competitive with new natural gas plants. 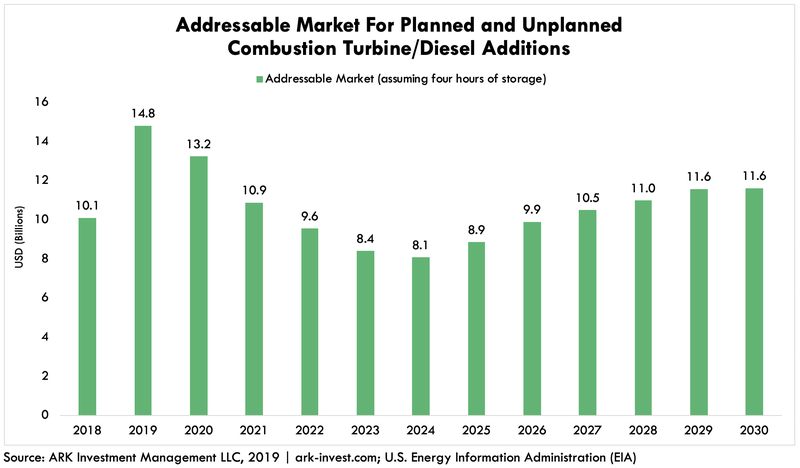 Because increases in capacity will be offset by battery cost declines, the addressable market in the U.S. should remain at roughly $10-12 billion per year, as shown below. In the future, underutilized electricity generation probably will be replaced by batteries. 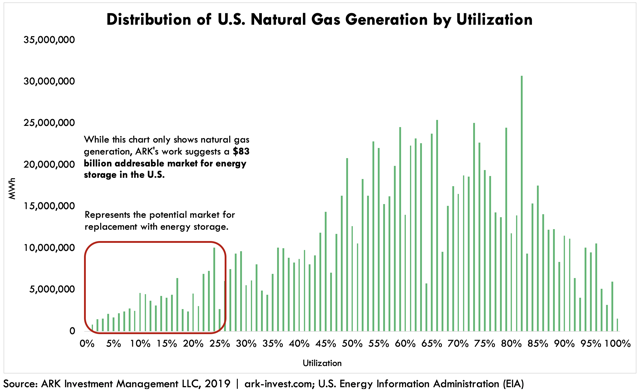 As shown below, while the average utilization for natural gas plants in the U.S. is roughly 55%, many plants are utilized less than 25% of the time. ARK's work suggests that replacing all of those plants would be an $83 billion energy storage opportunity in the U.S. and an $800 billion opportunity globally. 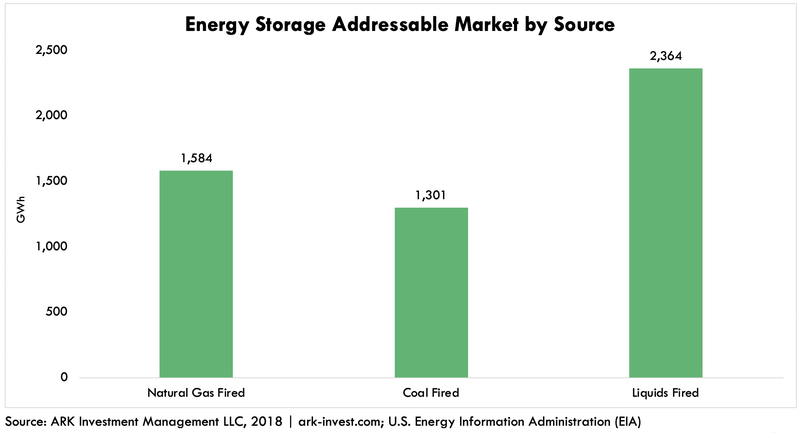 As shown in the second chart below, 5,000-gigawatt hours of storage capacity would take the place of all of the underutilized facilities - whether natural gas, coal, or liquids powered - around the world. Moreover, if battery costs continue to fall below $150 per kWh, the addressable market could scale well beyond $800 billion. Levelized cost of electricity defined as the price that a utility would need to charge for those electrons in order to generate cash flow sufficient to generate a reasonable return on capital on its capital expenditure to support the underlying project. Disclosure: ARK's statements are not an endorsement of any company or a recommendation to buy, sell or hold any security. For a list of all purchases and sales made by ARK for client accounts during the past year that could be considered by the SEC as recommendations, click here. It should not be assumed that recommendations made in the future will be profitable or will equal the performance of the securities in this list. For full disclosures, click here.